Signs of progress at the G20 meeting in relation to the trade talks between the United States (US) and China is likely to be the main driver of sentiment this week. The world’s two largest economies agreed not to increase the 10% tariffs on $200 billion worth of Chinese imports on Jan. 1 of 2019 following talks between US President Donald Trump and his Chinese counterpart Xi Jinping over the weekend. The two sides will engage in new trade negotiations with the objective of getting a settlement within 90 days. If no new agreement is reached in this time, the 10% tariffs will be raised to 25%. The trade fight between the world’s two largest economies has frightened global financial markets and performed as a drag on global growth. New home sales month-on-month in the US unexpectedly fell 8.9%, comparing to the previous month to a seasonally adjusted annual rate of 544K in October 2018, following an upwardly revised 597K registered in September and missing analysts forecasts of a 3.7% increase. New home sales were at the lowest level since March 2016. House buyers spend money on furnishing and financing their homes so as a result the demand for goods, services and the employees is stimulated. Generally, a high reading is seen as bullish for the USD, whereas a low reading is seen as bearish. Since the beginning of 2018 until last Friday close, the AUDUSD remains negative with a loss of over 6.0% but ended November above water with a 3.27% gain. Nonetheless, the currency pair ended the past week with a firmer tone gaining more than 1.0% and on the daily time-frame, closed slightly in the red with a minor loss of 0.07%. Furthermore, the AUDUSD is in a recovery phase. On last Friday session, the currency pair initially fell with a narrow range but found enough buying pressure near 0.7284 to erase most of its initial losses and closed near the high of the day, however, managed to close within Thursdays’ range, which suggests being slightly on the bullish side of neutral. The stochastic is showing a strong bullish momentum and is above the 50 midline. The double bottom created in October reached its projected target in November but now we may have the development of a double top. A double top pattern is the combination of two consecutive peeks that are roughly equal, with a moderate trough in-between that describes a change in trend and a momentum reversal from prior leading price action. The breakdown of the neckline at 0.7202 may set in motion the double top pattern that has a projected target at 0.7061. 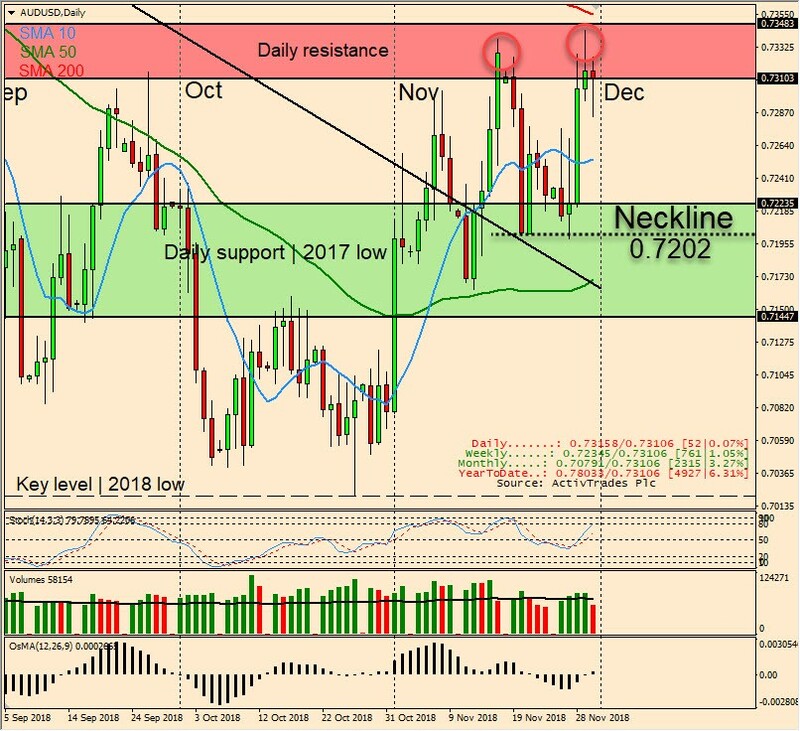 The confluence of the daily resistance zone ranging from 0.7348 down to 0.7310 with the 200-day moving average now at 0.7355 may prove to be a tough nut to crack by the currency pair. In addition, the fact of the progress in relation to the trade talks between the US and China should appreciate the USD in relation to the Aussie dollar. Monday, December 03 at 00:30 GMT (19:30 ET): The Australian Bureau of Statistics is scheduled to release the Building Permits month-on-month in October, which is expected by analyst to drop to -1.4% from a 3.3% registered in the previous period. This indicator is a key indicator of demand in the housing market. A higher than expected reading can be seen as positive for the AUD, while a lower than expected reading should be taken as negative. Tuesday, December 04 at 03:30 GMT (22:30 PM ET): The Reserve Bank of Australia (RBA) is scheduled to announce that the interest rates will remain unchanged at 1.5% as widely expected by market analysts. Wednesday, November 07 at 00:30 GMT (19:30 ET): The Australian Bureau of Statistics is scheduled to release the gross domestic product (GDP), analysts are estimating a drop on both quarter-on-quarter and year-on-year on the third quarter to 0.6% and 2.8% respectively. Monday, December 03 15:15 GMT (10:15 ET): The Federal Reserve (Fed) Governor Jerome H. Powell is scheduled to testify on the economic outlook and recent monetary policy actions before the Joint Economic Committee, in Washington DC. The testimony is in two parts; the first is a prepared statement, then the committee conducts a question and answers session. The Q&A portion of the testimony can see heavy market volatility for the duration. Friday, December 07 at 13:30 GMT (08:30 ET): The US Department of Labour is scheduled to release the nonfarm payrolls for November, which are estimated by marker analysts to decrease to 205K from 250K registered in the previous month. Generally, a high reading is seen as positive for the USD, while a low reading is seen as negative, although previous months reviews and the unemployment rate are as relevant as the headline figure, and therefore market’s reaction depends on how the market assets them all. Friday, December 07: The US Department of Labour is scheduled to release the unemployment rate for November, which is forecast by marker analysts to come in at 3.7% unchanged compared to the previous month. A decrease of the figure is seen as positive for the USD, while an increase is seen as negative, although by itself, the number can’t determinate the markets move as it depends on the headline reading, the nonfarm payroll.